A ten-foot, one-inch-wide plastic pipe. A bag of 2 to 6 inch-long curved body feathers from a goose or a swan or the larger feathers from a duck. Turkey or chicken feathers will do. One-inch to six inches long. Begin by scattering a handful of the smaller feathers on a cleared open space. A driveway or closely cropped grass is a good bet. 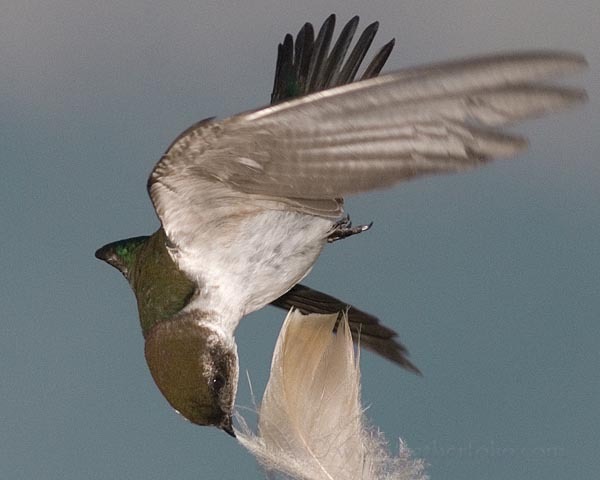 In my area, if barn, tree, or violet green swallows are building their nests nearby, they will find the feathers and swoop down to pick them up to line their nests. Nests with feathers, I read, have a higher success rate for hatching and rearing young than for those nests without feathers. If this is the case, you are doing a good deed. Once they have found your treasure trove of nesting materials and they know they can count on you for a continuing supply, they regularly come back for more. In return, you can count on them to be there for the next step. This is the time to bring out your ten-foot tube. Put a feather in the top end of the tube, raise it vertically, and blow the feather out. The birds will have their chance as the feather slowly floats on the air current. Swallows greatly prefer grabbing their feathers in the air than to swooping headfirst toward a feather lying on the ground. If you have them, start with two-inch feathers. Once the birds work up the courage and skill to grab these, you can work up to bigger and bigger curved feathers. These bird’s bodies, head to tail are only about 4 or 5 inches long, so a seven inch feather is a challenge to fly with, but they do. It is a bit clumsy at first and they will let go and re-grab the feather several times. That is unless another bird doesn’t get it first. If it does, a chase is on. It’s a great photo opportunity if you have a fast lens, are quick and lucky, and take a lot of shots, most which will be misses—these birds fly and swoop fast! I would like to figure out how to capture the action on video but am nowhere near the cameraman I would need to be. Please tell me if you know a technique that can video-capture these swallows on the fly, or if you have seen it done. Is it even possible?